New Rochelle, NY – Internationally acclaimed 3D Pop artist Charles Fazzino has been commissioned by United World Sports to create the official artwork for the 2014 USA Sevens International Rugby Tournament and Festival, which is Round 4 of the HSBC Sevens World Series of Rugby. The three-day elite-player, international tournament runs from January 24-26, 2014 at Sam Boyd Stadium in Las Vegas, Nev. Team USA and teams from 15 other countries will compete for points in the HSBC Sevens World Series standings while surrounded by one of the most electrifying atmospheres in sports provided by fans from the competing nations. Fazzino’s artwork will grace the cover of the event program and be available for purchase as the official event poster and limited edition fine artwork. 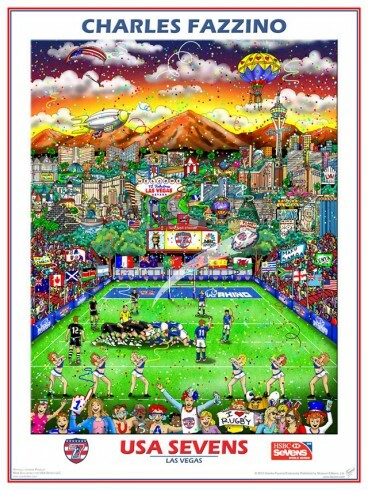 Fans can visit the Fazzino art exhibit and purchase both posters and fine artwork at the annual Rugby Fan Festival. The art will also be integrated throughout the event on marketing and consumable materials. 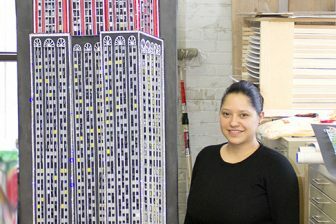 “I am proud to create artwork for the prestigious USA Sevens Rugby Tournament,” stated Fazzino from his New York Studio. 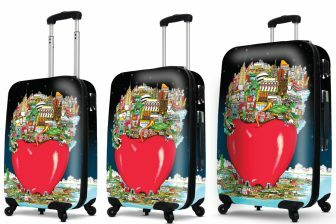 Fazzino’s artwork captures the signature high-energy atmosphere for which the tournament is known, incorporating the excitement of the tournament play, costumed fans, and international flavor of the event. In addition to availability on-site at the USA Sevens Tournament, all interested fans may purchase the Fazzino USA Sevens Rugby Art Collection online at World Rugby Shop. USA Sevens is the fourth stop in the HSBC Sevens World Series which also includes tournaments in Australia, Dubai, South Africa, New Zealand, Japan, Hong Kong, England and Scotland. Tickets are still available for purchase to the event at www.usasevens.com/las-vegas. Charles Fazzino — one of the most popular artists in the world — is most well-known for his unique, detailed, and vibrant three-dimensional style. His work is exhibited in hundreds of fine art galleries and museums in twenty different countries. He is an officially licensed artist of the National Football League and the Super Bowl (2000-present), Major League Baseball and the MLB All-Star Game (2003-present), and the US Olympic Team (2000-present). He has also recently created official artwork for high profile events, including: the 2011 Centennial Celebration for the City of Fort Lauderdale, the President’s Challenge for President’s Council on Physical Fitness and Sports, NASCAR Sprint Cup series, NHL All-Star Game, Belmont Stakes, Daytona 500, Indy 500, Andy Roddick Charity Gala, U.S. Tennis Foundation, CMA Awards, Grammy Awards, Daytime Emmy Awards, NBC’s “Today” Summer Concert Series, Rosie O’Donnell’s For All Kids Foundation and the President William J. Clinton Presidential Foundation, among many others. You can view more of Fazzino’s work at www.fazzino.com.